Chickasaw Nation is a federally recognized tribe headquartered in Ada, Oklahoma. The Chickasaw Nation jurisdiction includes Byran, Carter, Coal, Garvin, Grady, Jefferson, Johnston, Love, McClain, Marshall, Murray, Pontotoc, and Stephens counties of Oklahoma. Today Chickasaw Nation has a well-established three-branched government that is dedicated to empowering and serving its people. The Chickasaw were successful tradesmen, conducting business with other Southeastern Indians, and with the French and English nations. They mostly lived an agrarian lifestyle. However, when necessary, the Chickasaws were quick to go to battle and were often revered in ancient times by early European historians as “Spartans of the Lower Mississippi Valley.” They allied with the English during the French and Indian War and have sometimes been credited as the force behind the English prevailing in the war, which resulted in the United States being an English-speaking country. The Chickasaw people along with the other Southeastern tribes were removed to Indian Territory during the “Great Removal” on what is known as the “Trail of Tears”; the Cherokee, Choctaw, Creek and Seminole. Because they negotiated their own removal terms the Chickasaws were one of the last tribes to be removed from their Homeland. In 1837, the Treaty of Doaksville called for the resettlement of Chickasaws among the Choctaw Nation in Indian Territory. In 1856, in order to restore direct authority over their governmental affairs, the Chickasaws separated from the Choctaws and formed their own government and elected their first governor. They adopted a new constitution in 1983. Today, the Chickasaw Nation is economically strong, culturally vibrant and full of energetic people still dedicated to the preservation of family, community and heritage. Its tribal government has focused most of its efforts on building an economically diverse base to generate funds that will support programs and services to Indian people which will continue to greatly enhance the quality of life for all Chickasaws. These programs and services range from acting and art courses to culturally appropriate mental health and substance abuse programs to assisted living services. The Chickasaw remained in their homelands of western Tennessee and northern Mississippi until the 1830s. After decades of increasing pressure to cede their land from the Federal and state governments, the Chickasaw finally agreed to cede their remaining Mississippi Homeland in the Treaty of Pontotoc Creek and relocate west to Indian Territory. During Indian removal of the 1830s, the United States government first assigned the Chickasaw to a part of Indian Territory west of the Mississippi River controlled by the Choctaw Nation; their area in the western area of the nation was called the Chickasaw District. It consisted of Panola, Wichita, Caddo, and Perry counties. Although originally the western boundary of the Choctaw Nation extended to the 100th meridian, virtually no Chickasaw lived west of the Cross Timbers, due to continual raiding by the Plains Indians of the southern region. The United States eventually leased the area between the 100th and 98th meridians for the use of the Plains tribes. The area was referred to as the “Leased District”.”. The division of the Choctaw Nation was ratified by the Choctaw–Chickasaw Treaty of 1854. The Chickasaw constitution establishing the nation as separate from the Choctaws, was signed August 30, 1856, in the new capitol of Tishomingo (now Tishomingo, Oklahoma). The first Chickasaw governor was Cyrus Harris. The nation consisted of five divisions; Tishomingo County, Pontotoc County, Pickens County, and Ponola County. Law enforcement was by the Chickasaw Lighthorsemen, although non-Indians fell under the jurisdiction of the Federal court at Fort Smith. Following the Civil War, the United States forced the Chickasaw into new peace treaties because of the support of many of the Five Civilized Tribes for the Confederacy. Under the new treaty, the Chickasaw (and Choctaw) ceded the “Leased District” to the United States. In 1868, the Chickasaw Montford T. Johnson, with Jesse Chisholm‘s help, secured an agreement with the Plains tribes to establish a ranch on the new western edge of the Nation. His ranch was never raided, although often threatened. He and his family remained the only permanent residents of the area until the settlement of Oklahoma after it was admitted as a state. Under the Dawes Act, the Chickasaw nation was dissolved, with government functions transferred to the federal government before statehood, by agreement negotiated with the Dawes Commission. Following the breakup of the nation, the Chickasaw became citizens of the United States. The US allotted the communal land in plots for individual households of registered members. Land left over was declared “surplus” and made available for sale to non-Indians, so they lost much of their tribal lands. In the second half of the 20th century, the Chickasaw reorganized their tribal government. They adopted a new constitution on August 27, 1983 to manage their business affairs. The Chickasaw Nation is a federally recognized tribe headquartered in Ada, Oklahoma. The Chickasaw Nation jurisdiction includes Byran, Carter, Coal, Garvin, Grady, Jefferson, Johnston, Love, McClain, Marshall, Murray, Pontotoc, and Stephens counties of Oklahoma. The Chickasaw language was the primary language of Chickasaw people for hundreds of years. 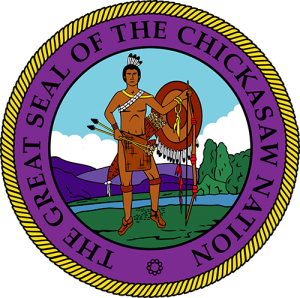 Chickasaw is a Muskogean language, and Chickasaw and Choctaw together form the Western branch of the Muskogean language family. Chickasaw is also related to Alabama, Koasati, Mvskoke (Creek)—Seminole, Hitchiti and Mikasuki. Language loss occurred over time. Government boarding schools discouraged Indians from practicing their cultures and speaking their languages. Learning English was encouraged by some Chickasaw people because English was a necessary skill in negotiating with non-Indians. Speaking the Chickasaw language was often discouraged, even in tribally run schools. The current state of Chikashshanompa’ (the Chickasaw language), is similar to that of most tribes in the United States. Less than 20 languages spoken by tribes in the United States are projected to survive another 100 years. In 1994, the estimated number of fluent Chikashshanompa’ speakers was less than 1,000. Today, there are less than 75 speakers, with the vast majority older than age 55. The value of speaking the language has been realized and several programs and services have been established over the years to revitalize the Chickasaw language. Tribal employees and Chickasaws of all ages are participating in community language classes, language camps and clubs, the Chickasaw Master-Apprentice program as well as learning through self-study programs, language classes on Chickasaw.tv and using the Chickasaw Language Basics app. Today, the Chickasaw Nation is economically strong. The tribe owns two off-track wagering facilities, 18 casinos, two bingo halls, 18 tribal smoke shops, seven motor fuel outlets, and two truck stops. They also own and operate Bedré Fine Chocolate in Davis, Lazer Zone Family Fun Center in Ada; WinStar Inn and Suites and Golf Course in Thackerville; Solara Healthcare in Westlake, Texas; Chickasaw Nation Industries in Norman, Oklahoma; Global Gaming Solutions, LLC; KADA (AM), KADA-FM, KCNP, KTLS, KXFC, and KYKC radio stations in Ada; and Treasure Valley Inn and Suites in Davis. Their estimated annual tribal economic impact is over $13.9 billion. In addition, the Chickasaw Nation operates historical sites and museums including the Chickasaw Cultural Center, Chickasaw Nation Capitols, and Kullihoma Grounds. Their casinos include Ada Gaming Center, Chisholm Trail Casino, Gold Mountain Casino, Newcastle Casino, Riverwind Casino, Treasure Valley Casino, SaltCreek Casino, and WinStar World Casino. They also own Lone Star Park in Grand Prairie, Texas and Remington Park Casino in Oklahoma City.